Over medium- high heat, heat the olive oil in a medium skillet. Flour each slice of mozzarella, dip the slices in the egg mixture, and cot with bread crumbs. 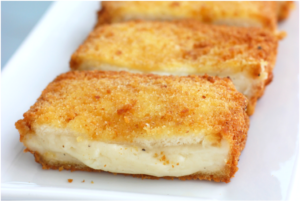 Fry the mozzarella slices in single layer batches, turning when browned on bottom side, about 2 minutes. Remove with a slotted spoon or spatula, and drain on paper towels. Salt to taste and serve.